The best tips for growing horseradish when home vegetable gardening. Learn how to plant, care for, and harvest horseradish in your backyard garden. Gardeners who enjoy hot sauce should try their hand at planting horseradish. The plant needs cold autumns and winters to intensify its flavor. It can be mulched and dug for winter use and is also forced indoors to produce tasty leaves for winter salads. In spring, the first leaves that appear in the garden are often used for potherbs. Radish comes from the Latin word for root. The best known reputation of horseradish rests on its use as an intensively flavored condiment. In fact, some people are surprised to learn that horseradish is actually a vegetable! New Bohemia and Maliner Kren are two common varieties. 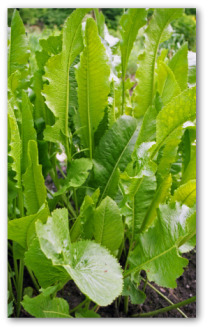 Horseradish is a perennial member of the mustard family. It is propagated from root cuttings or crowns and planted in the springtime. In a short growing season planting works best if the whole root with crown attached can be taken from another garden in fall or early spring. As soon as the ground is workable, plant root cuttings in 6 inch deep furrows made in an organic enriched soil. Set cuttings at a 45 degree angle with tops 3 inches below the surface. Space the roots 24 inches apart or for intensive spacing, space roots 10 to 12 inches apart. After all the root cuttings are planted, fill the row with topsoil. A dozen plants should be more than adequate. Give this perennial its own garden bed or section of bed and control its invasive growth. 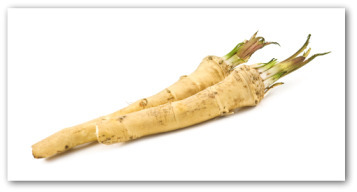 Horseradish prefers deeply prepared, well-drained loam with a pHH of 6.0 to 7.0. Keep the soil moist and feed every three to four weeks with a 6-6-6 or 5-10-10 fertilizer. Potassium is a critical nutrient in growing horseradish. Pest and disease problems are rare with growing horseradishes. Keep the harvests ongoing by moving your vegetable gardening activities inside over the winter. The garage or potting shed works fine for this purpose. 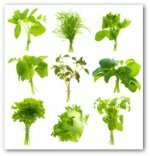 There are a number of root crops such as horseradish that you can dig, relocate indoors, and force for spicy midwinter greens. The basic equipment needed for an indoor winter garden is an ample sized container like a garbage pail or plastic tub, well-draining soil mix, and a watering can. You will not have to be concerned about lighting since these plants need darkness to sprout. Adventuresome salad makers can dig horseradish roots in fall before the ground freezes hard. Replant in a soil-filled container. Cover the roots with a 6 to 8 inch layer of damp sand or sawdust. Give the roots a cool and dark rest in cool temperatures from 50 to 60 degrees for producing a second harvest. The tender new leaves that appear will have a bite to them, so mix these greens with milder ones to temper their flavor. As the plants grow and leaves reach 8 inches in height, a cultural process called lifting is performed to grow smooth roots free of side growths. Remove soil from the upper end of the main root and trim away small side roots. When trimming is completed, mound the soil up to its original level. Repeat this procedure in a few weeks. Delay harvesting until the roots have been touched by frost. 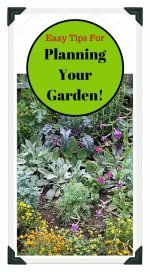 Store in a root cellar or mulch the bed and dig throughout the winter as needed. Oil within the root gives sauces and purees a biting taste. 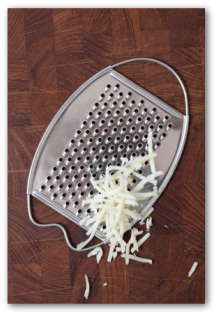 Horseradish to peel, then grate or boil is great for cooking on roasts or in seafood sauces. Piece-roots planted in the spring will make good roots by autumn. Set them vertically, small end down and large end 2-3 inches below soil surface.